It is two years since they buried the remains of Amelia Root on the edge of Mosswood in the small affluent town of Tabwell, and for Jenny Adams, life has moved on. She has created an idyllic new home with her fiancé, Jake, the son of a wealthy businessman, while Jenny's father, Robert, has settled down with Josie Duxbury who runs The Keys, a popular suburban pub. This is, ostensibly, the editor's review of A Rising Evil - book two in Graham West's Beyond The Dark Waters series, released 29th June, 2018. Except, I wasn't the editor this time, and that is a story in itself. Andrea - my bestie and also my editor - does rather enjoy a good horror/paranormal story, so she willingly took on the editing of Graham's series. Her editing style is...well, let's say it's for the hardy. What ensued was some really funny editor-author banter because not only can Graham tell a corking story, he's also got a wicked sense of humour, fortunately, seeing as he hadn't seen Andrea go to town on Finding Amelia (book one of the series). I did tell him that if there was no red pen, he was doing it right. Ultimately, all authors need an editor who will fearlessly take them to task if the need arises. I'm not advocating meanness. The best kind of feedback/guidance is clear, honest and, above all, respectful. It needs to take the author's feelings into consideration but without kowtowing. When it comes to editing a series, the editor also needs to have some idea of how each instalment fits into the whole and know the characters well - perhaps as well as the author knows them. Certainly, the editor will retain a sense of how the author wishes to portray their characters, to the extent they notice if something is 'out of character'. All of this makes Andrea the perfect editor for Beyond The Dark Waters, particularly as Graham made the risky but right decision to switch from first- to third-person for book two. In Finding Amelia, the narrator is Rob Adams, a widower whose youngest daughter and wife were killed in what appeared to be a horrific accident, leaving Rob and older daughter Jenny picking up the pieces and trying to get on with their lives. By the end of book one, Rob's story is done, up to a point, but the events (supernatural and otherwise) have far-reaching consequences. Aside from Rob passing the narrative baton to Jenny, there are other prominent players whose lives intertwine with the Adams's, the details of which Jenny is not privy to. What we readers discover in A Rising Evil is, in essence, what the title tells us. This story is so much more than what happened to Rob and Jenny in the aftermath of tragic loss, and finding Amelia was not the solution. So book two (and book three) is told in third-person, from multiple perspectives, and the shift doesn't jar in the slightest because each scene expertly depicts the nuances of each character. Nor are those characters perfect. At times, I want to take Rob Adams to task on his sexism - same for a lot of the other male characters - but I can't argue against the accuracy of the gender role portrayal. Luckily, the female characters aren't pushovers. As infuriatingly real as the men are in this book, I sense a deeper theme underscores the trials of adultery and over-protectiveness, and it is, perhaps, pivotal to 'the rising evil'. I guess I'll find out soon enough (well, summer 2019) when Mosswood (book three) is released. It's currently with the editor. All in all, A Rising Evil is an excellent second instalment in Graham's series, taking us deeper into those dark waters. The story concludes in itself, but there are plenty of threads yet to be woven. 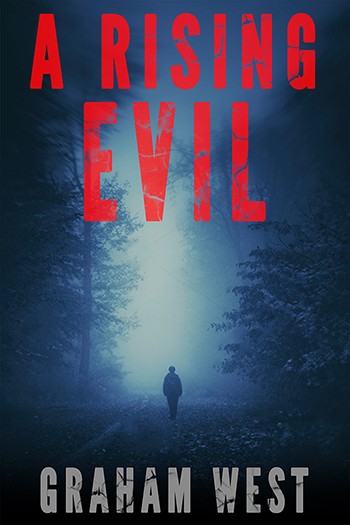 Whilst readers could pick up A Rising Evil and enjoy it without reading Finding Amelia, this series is best read in order. 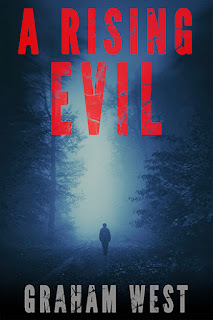 A Rising Evil is a paranormal thriller, written by Graham West, and is available in ebook and paperback formats from Beaten Track and all the usual places.